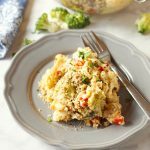 This Cheesy Broccoli Cauliflower Casserole is the perfect side dish for the holidays or any occasion! Made with tons of fresh veggies and an easy homemade cheese sauce, and baked to comfort food perfection! Steam the broccoli and cauliflower florets just until bright in colour and only slightly tender (3-4 minutes). Set aside. Preheat the oven to 375 degrees Fahrenheit and grease a large 9-inch by 13-inch baking dish. Heat a medium pot over medium-low heat and add the butter. Melt the butter in the pot and add the flour, whisking constantly for about 1-2 minutes. Slowly pour in the milk, whisking constantly to remove lumps. Add the nutmeg and salt and pepper, whisking to combine. Add the cheeses and stir gently until melted and the cheese sauce is smooth. Add the steamed veggies and the diced red pepper to the bottom of the baking dish, pouring the hot cheese sauce over the top. Stir just a little bit to be sure all the veggies are well coated in the sauce. Mix the breadcrumbs and parsley in a small bowl and sprinkle them evenly over the top of the veggie and sauce. Drizzle the melted butter over top of the breadcrumb topping and bake, uncovered, for 25-30 minutes or until the cheese sauce is bubbling and the topping is golden brown.